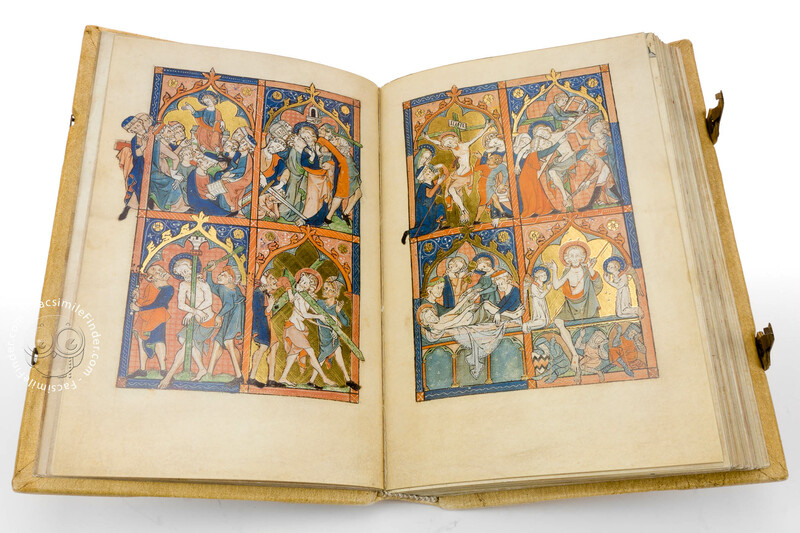 The Ramsey Psalter is one of the most elaborate Gothic manuscripts from the United Kingdom. 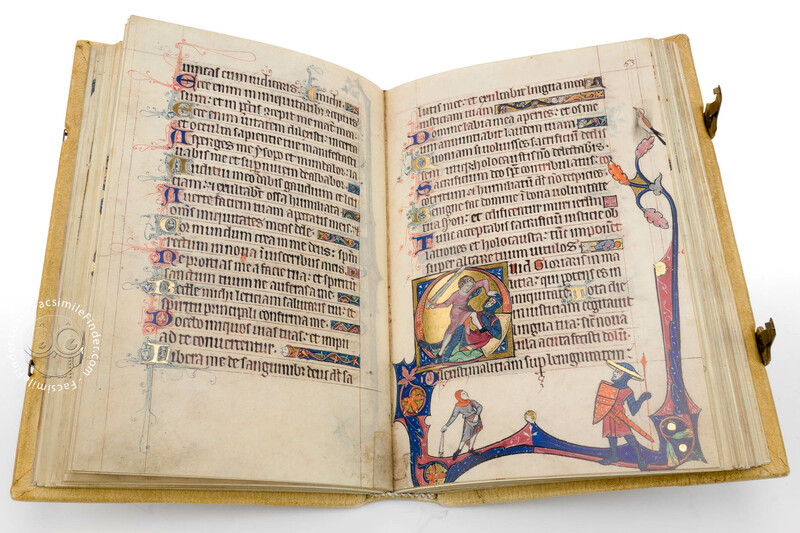 The codex was written and illuminated in the last quarter of the 13th century and it features 40 superbly made illustrations and 12 deluxe figural initials. 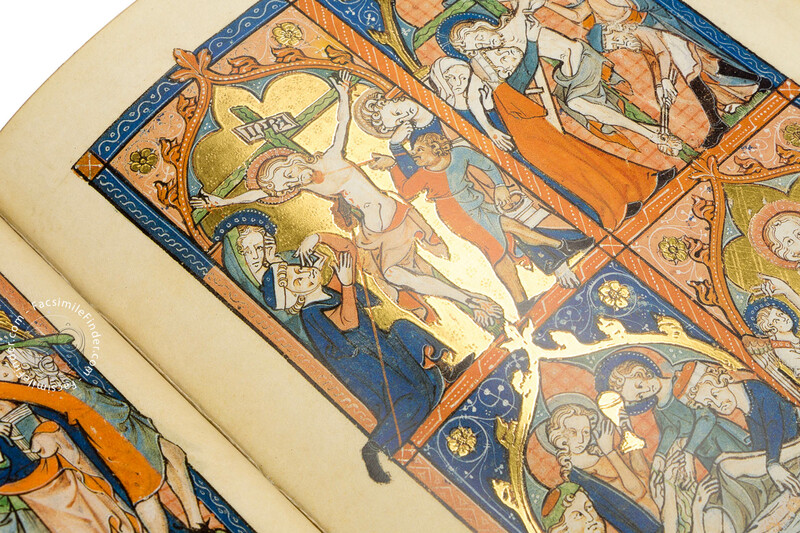 The excellent and extensive use of gleaming gold, not for the miniatures alone but also for border decorations and initials, makes this manuscript unique in style and elegance. 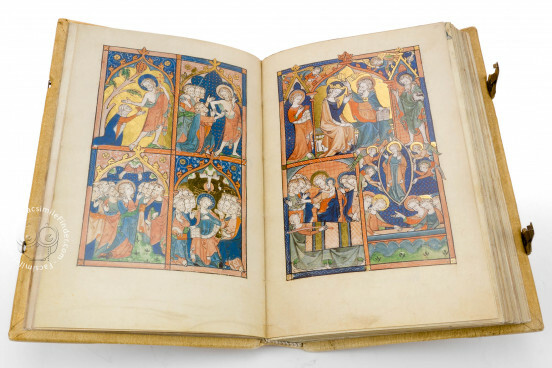 Written toward the end of the 13th century the Ramsey Psalter takes its name after the place of production, that is Ramsey Abbey in Huntingdonshire, England. 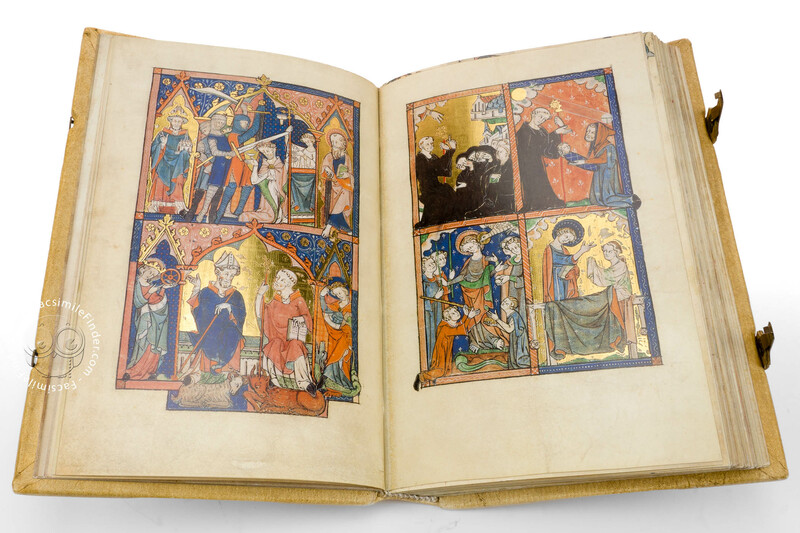 The iconographic apparatus of the manuscript is certainly worth of notice as it exhibits 40 miniatures illustrating scenes from the Old and New Testament and from the lives of the saints. 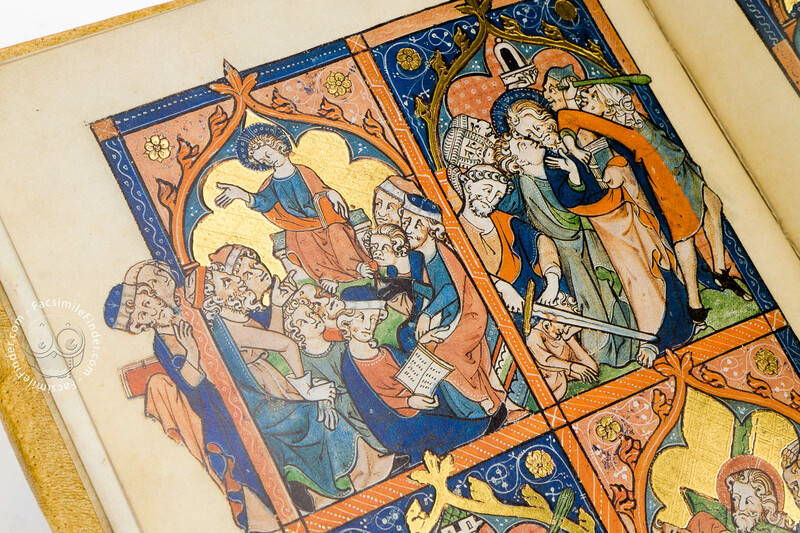 The figures, slightly oversized in proportion to the space, feature expressive gestures and lively appearance. The decorations play a significant part in the iconography of the manuscript given that each leaf is divided into four compartments – one for each miniature – featuring burnished gold backgrounds and rose and blue. 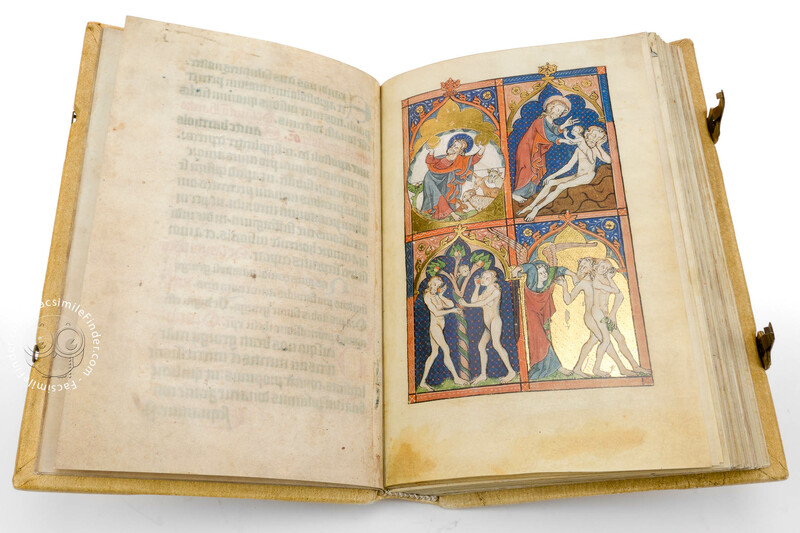 The manuscript seems to have been commissioned by the abbey cellarer, Walter of Grafham, as a gift to the abbot John of Sawtry. 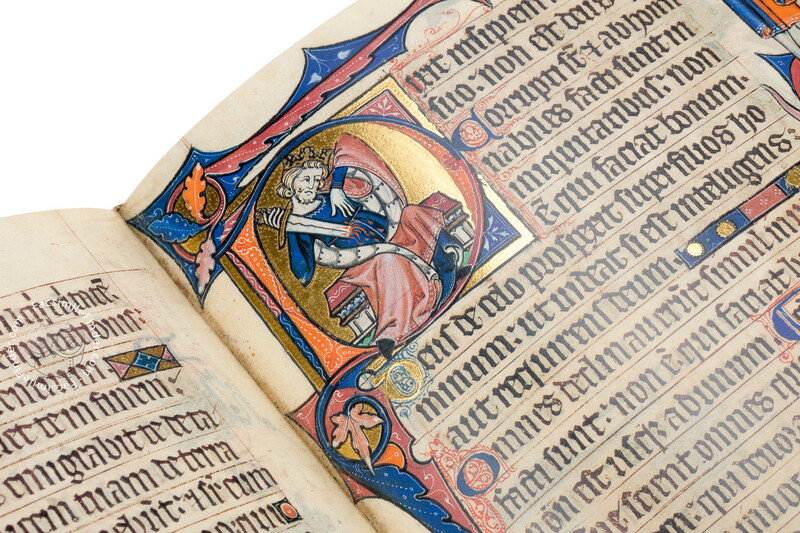 Evidence of this is the figure of the commissioner on f. 16v depicted as the head of a benedictine monk and accompanied by "Grafham honoretur". 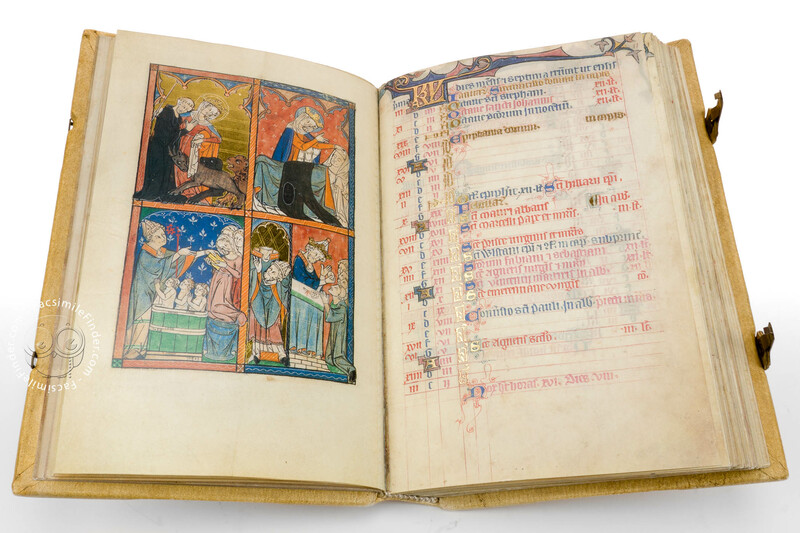 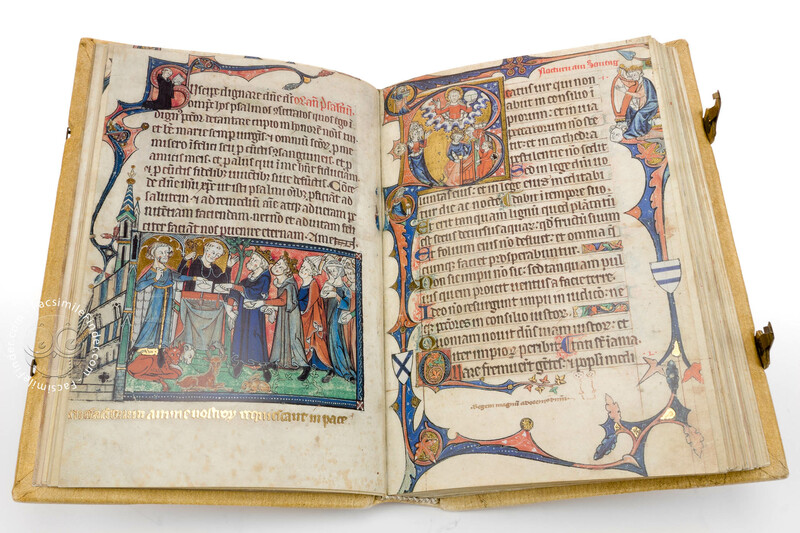 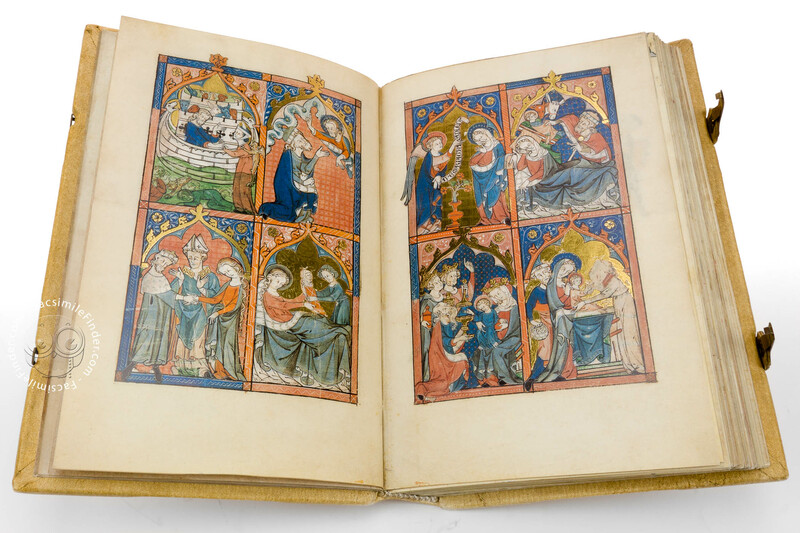 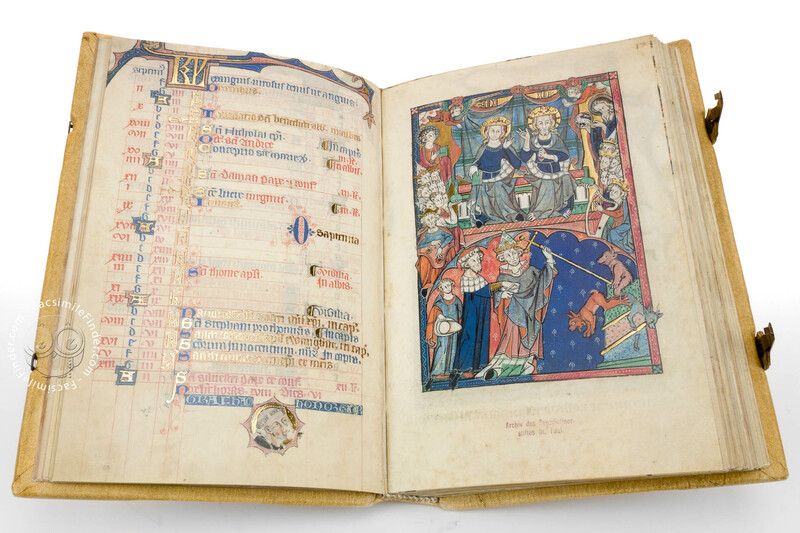 The Ramsey Psalter experienced a turbulent history as, at some point, 5 folios were separated from the manuscript only to be later found and safely preserved in the Pierpont Morgan Library in New York. 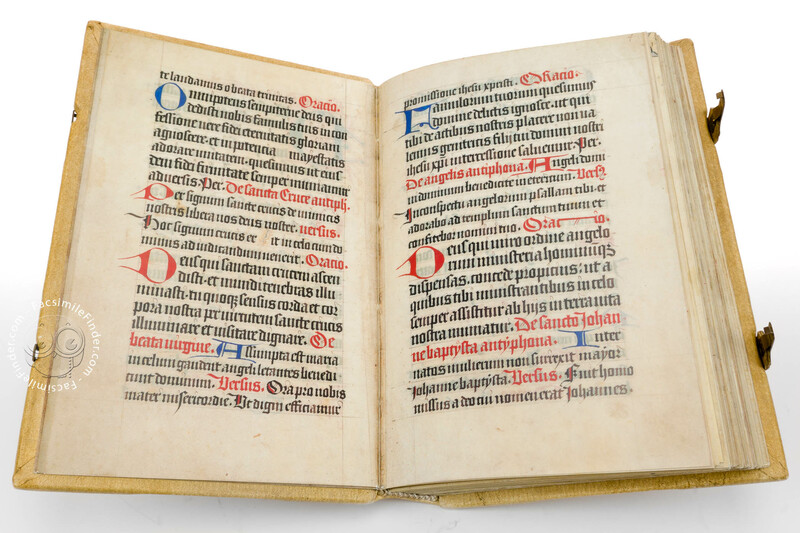 The rest of the manuscript – the larger portion – remains in the library of the Benedictine Abbey of Sankt Paul in Lavanttal (Carinthia, Austria). 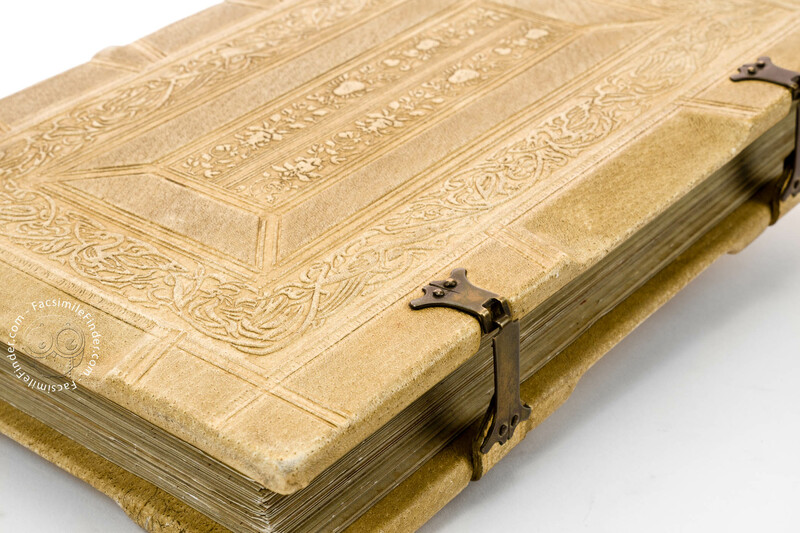 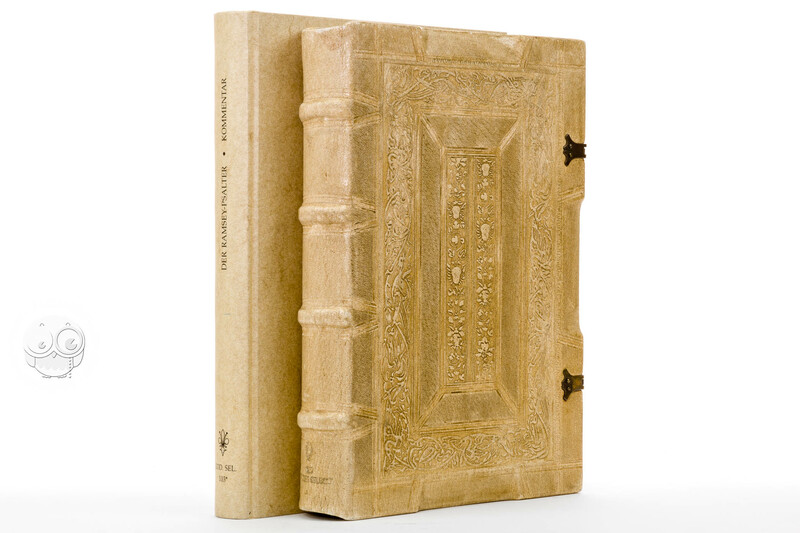 Unfortunately, having the manuscript lost its original binding, it is currently bound in modern red velvet and stored in a red morocco case. 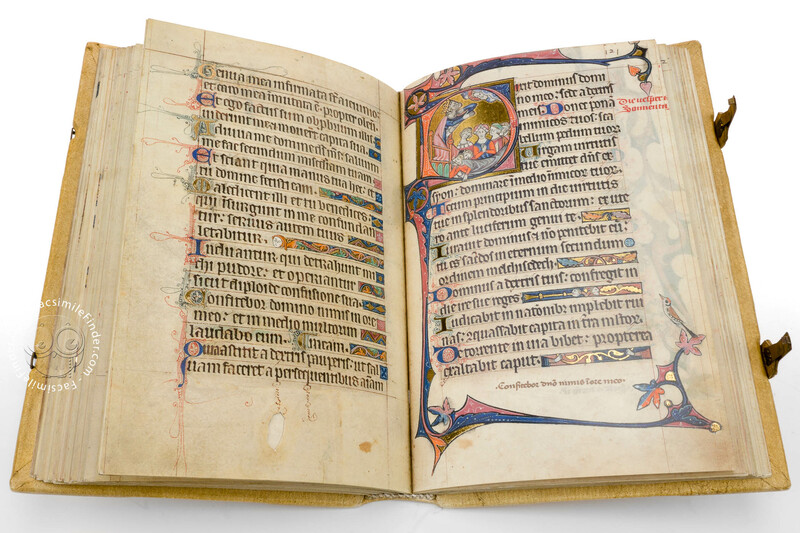 Manuscript book on parchment − 26.5 × 17 cm − 346 pp. 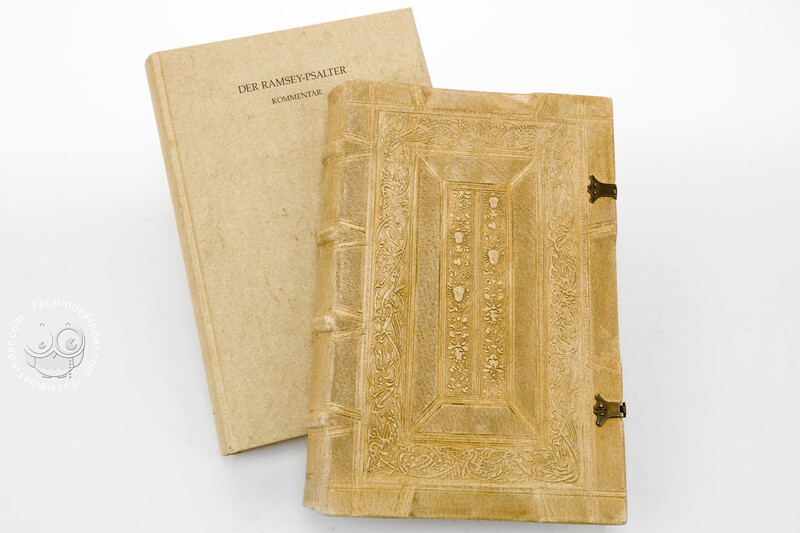 Full-size color reproduction of one or more portions of the original document, Ramsey Psalter: the facsimile attempts to replicate the look-and-feel and physical features of the original document; pages are trimmed according to the original format; the binding might not be consistent with the current document binding.